[% 11070 | | Seabourn %] has revealed the inaugural-season itineraries for its newest ship, the Seabourn Odyssey. 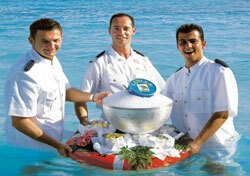 The ship will sail its first cruise on June 24, 2009, from Venice to Istanbul. The Odyssey’s schedule also calls for visits to the Caribbean islands. In addition, the new ship will launch Seabourn’s first world cruise in January 2010. The Odyssey will call in ports on five continents during this 108-day journey. The Seabourn Odyssey may be larger than its sister ships, but it will provide the ultra-luxury experience for which the cruise line is known. The ship will carry only 450 guests, and maintain a ratio of nearly one staff member per passenger. The all-suite, all-oceanview ship will offer balconies on 90 percent of staterooms. Pampered guests will find granite and marble bathrooms with separate tubs and showers, Molton Brown products, complimentary in-room bars, and flat-screen televisions. But there will be plenty of reasons to leave your cabin, too. A new concierge lounge, called Seabourn Square, allows guests to access various services in a club-like, sociable atmosphere. Here you’ll find a library, shops, outdoor terrace, coffee bar, and concierge desks. The two-deck Seabourn Spa will be the largest on any luxury ship, and will feature a waterfall and thalassotherapy pool. The Odyssey will offer Seabourn’s signature programs, such as complimentary “Massage Moments” and “Movies under the Stars” onboard, and “Shopping with the Chef” and “Caviar in the Surf” ashore. Fares for the Odyssey’s maiden season range from $1,290 to $7,035 per night, based on double occupancy. If you can afford rates that high, reservations open to the public on November 5. First dibs on cabins are going to cruisers who put down a deposit to get on a [% 2390044 | | waiting list %] earlier this year.